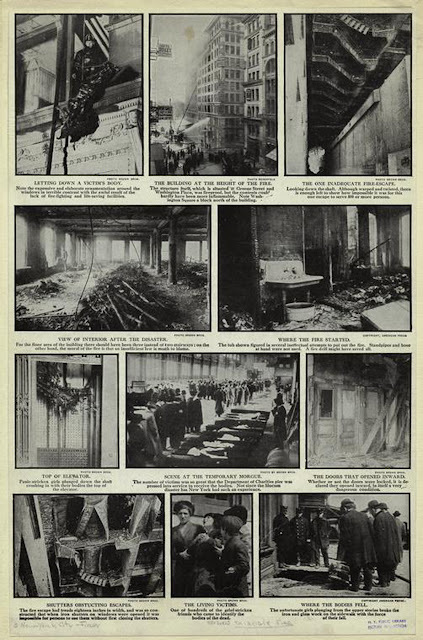 March 25th marks the 100th anniversary of the horrific fire that claimed the lives of 129 women and 17 men at the Triangle Shirtwaist Factory on Washington Place. Much has been written about fire, and you can read the history and details here. Something also worth reading is this eye-witness account of the horror, recorded by United Press reporter, William Shepherd. One girl climbed onto the window sash. Those behind her tried to hold her back. Then she dropped into space. I didn't notice whether those above watched her drop because I had turned away. Then came that first thud. I looked up, another girl was climbing onto the window sill; others were crowding behind her. She dropped. I watched her fall, and again the dreadful sound. Two windows away two girls were climbing onto the sill; they were fighting each other and crowding for air. Behind them I saw many screaming heads. They fell almost together, but I heard two distinct thuds. Then the flames burst out through the windows on the floor below them, and curled up into their faces. Up in the [ninth] floor girls were burning to death before our very eyes. They were jammed in the windows. No one was lucky enough to be able to jump, it seemed. But, one by one, the jams broke. Down came the bodies in a shower, burning, smoking-flaming bodies, with disheveled hair trailing upward. They had fought each other to die by jumping instead of by fire. Painful interviews with several survivors can be found here. It's sickening to know workers had complained about fire safety in the factory - even on the morning of the fire - and management chose not to listen. In some instances, even ridiculing the women, saying, "If you'll burn, there'll be something to put out the fire." Many events will be happening on Friday to commemorate the fire, details of which can be found at WNYC. Happy Birthday to Master Monty!